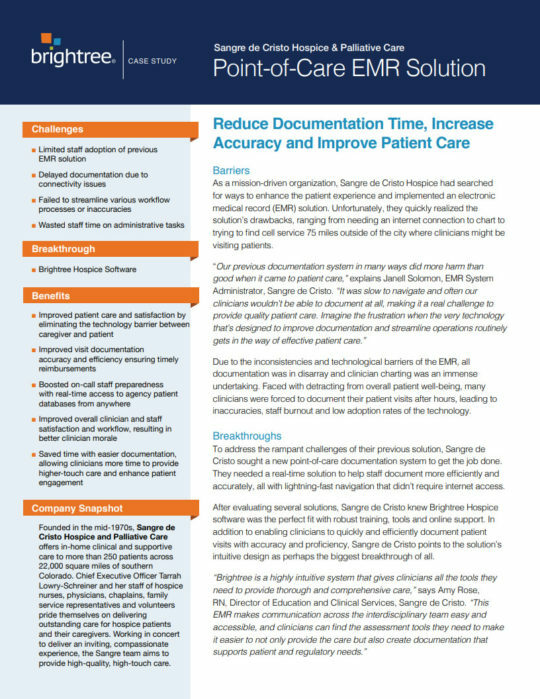 “Everything is right there in the system – previous assessments, care plans, lab notes, medical history, team notes, doctor’s orders and even communication with family members,” reports Tarrah Lowry-Schreiner, CEO, Sangre de Cristo. The speed and reliability of the Brightree software has led to a significant increase in documentation accuracy and efficiency. Additionally, since implementing Brightree’s solution, the organization’s patient satisfaction scores have increased dramatically, now ranking in the nation’s top 8 percent.